We just got through unusually cold weather and with winter creeping quickly upon us, a warm jacket is an absolute necessity. While parkas and down-filled coats do a great job at keeping you warm, they don't always pair well with formal attire. The peacoat was originally designed for military use, to keep sailors warm at sea. It has since evolved into a stylish garment worn by any man. It is characterized by its wool material and high collar making it the ideal garment for late fall and early winter. We rounded up 5 pea coats you should rock this winter in this article. Keep reading. My Favorite Peacoats in a Short List! How Should You Wear A Peacoat? If you’re short on time, here’s a quick recap of our favorites. Got 5 minutes? Keep reading to learn about what makes for a good peacoat. The term “peacoat’ comes from the Dutch word “pije” which was used to describe a coat with a coarse woollen fabric in the 16th century. They were originally designed for sailors who climbed the riggings of sailing ships—the indented waist and flared hips make it easy to move around in. ​Peacoats are normally a shorter length, stopping around the hips and made from wool or a wool-blend. The front is usually double-breasted with large buttons (usually made of metal, wood or plastic with anchors designed on them). They have a shape that is flattering to almost every body type. The type of fit you go for would depend on your preferred look: do you want a more athletic look or would you prefer to have a little room for layering? It all depends on your style. In addition to the fit, the peacoat is known for its oversized collar. It dresses up the coat and is also functional. The convertible collar was designed to be worn up in order to shield sailors from the cold winds at sea without obstructing their vision. It can also be closed up or left open to control heat. The melton wool material is heavy and durable enough to help keep the cold, wind and rain out. The wool fabric kept the sailors warm on cold nights at sea while the double-breasted design kept them put together. You can either layer up your peacoat or wear it sparingly. Men’s wool peacoats actually don’t fit into any specific look. They can be dressed up or worn with a casual outfit like jeans or track pants. They can be incorporated in various styles to make them the best men’s winter coats out there. Here's a quick video to give you the rundown on peacoat style. Continue reading to see which ones made our topic picks. Indeed, with so many puffy, down-filled jackets out there, a slim, tailored fit peacoat could be a suave and versatile alternative to the typical winter gear. Looking for a peacoat? Here are things you should consider when shopping for one. Despite its classic style, there are various designs around. You may have seen the traditional double-breasted design with two rows of buttons quite often but there is the single breasted style as well which gives off a polished finish. The style you go for depends entirely on you. The double-breasted style provides a classic look that can add appeal to your entire outfit. However, the double-breasted peacoat is considered more smart than the single-breasted one—just something to keep in mind if you’re looking to wear one to a formal event. Adding some color can change the way the peacoat looks. Depending on which hue you go for, you can create a bold, versatile or muted look. Dark navy blue is its traditional color (since it was originally made for sailors) but you can now find them in black, grey, tan and brown. We’d recommend black and navy as the safest and most versatile peacoat colors. Black is the classic color of every winter coat out there. That is perhaps because it is versatile, flattering and is easier to keep clean. It is also the perfect color to match with your other garments as you can create an endless amount of combinations with it, incorporating splashes of color into your outfit. For example, a blue outfit can create a clean contrast to a black peacoat while a bright color like yellow will give you a more vibrant look. Formal wear is usually dark in color so a black peacoat is the go-to coat to provide a sharp sleekness to an outfit. You can pair a black peacoat with a black suit, white shirt and tie to achieve a classic look. Perhaps even add a bit of color to the mix to keep it perfectly tailored yet unique? Just don’t overpower the look with color—stick to dark-toned colors like navy or burgundy to keep the outfit smart and put together. Navy is softer than black, but just as versatile. It is a perfect color if you want something solid yet classic but have a wardrobe that is dominated by lighter colors that may not work with black. The good thing is that navy can be paired with a variety of colors and is perfect for matching with casual clothing to get a more light and relaxed look. There are plenty of coats out there but it is indeed difficult to find one that is as versatile, classic and functional as a peacoat. Our top 5 list will give you the top choices of men’s peacoats that we could find. BGSD’s Mark classic wool blend is a great winter peacoat because it is made from 70% wool (which keeps you very warm) and 30% polyester. That also means that it’s dry clean only. Its construction is also better than quite a lot of brands in the same price range. This coat looks expensive and feels expensive. You can also layer nicely in this peacoat and dress it up or down—it looks good with both dress pants and jeans. The sleeves on them are quite long, and there is enough room in the coat so you can wear a suit underneath it with some room left. You should note that the buttons on this peacoat are not very strong. The buttons on one side seem to be put on loosely (so you can button the coat more easily) so you may have to secure them better. However, each button on that side is secured by a smaller button behind it so it may work fine. Since there are only three rows of buttons, if you want to flip up the collar, there is no higher button to hold it closed, letting some cold in during winter weather. So you’d need a warm scarf. 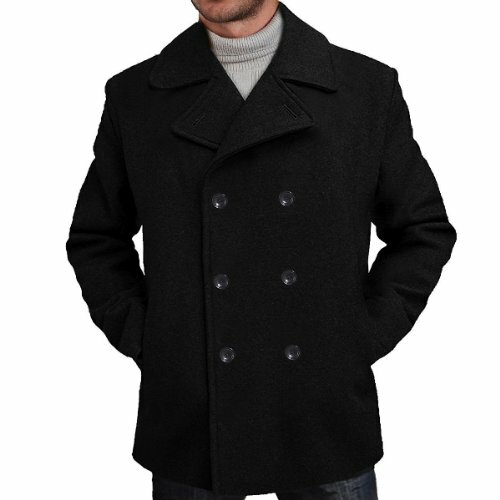 This classic peacoat is 60% wool, 25% polyester and 15% other fibers but it is heavier than it looks and ships with its own hanger. It has two rows of buttons which give it a lasso peacoat look but those buttons may need to be reinforced by sewing as they seem a bit loose. It fits well with enough room to wear a sweatshirt underneath and stuff a scarf down the front so it should keep you warm during winter months. The sleeve length is quite long—they can extend mid-palm which is great when you’re wearing a pair of gloves to prevent the wind from blowing up your arms. Saying that, the coat may be a bit large if you’re just wearing a t-shirt underneath. The bottom goes several inches below the belt line but it is tapered well so don’t worry, it won’t look like you’re wearing drapes. 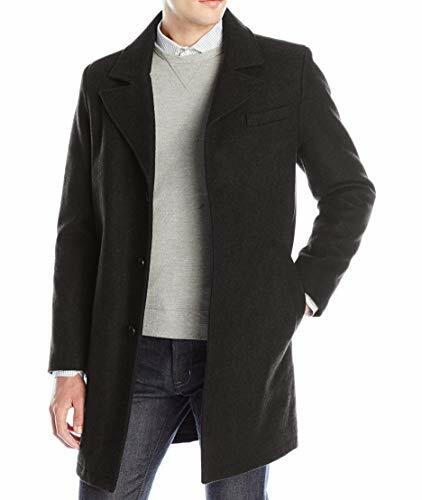 This Kenneth Cole peacoat is 60% wool, 32% polyester, 4% nylon and 2% other fibers. The material is good and so is the tailoring. It is quite heavy and is adequate for the cold winter temperatures. What we like about it is that it is quite stylish and can be worn to work or on a night out. It is simple, sleek, versatile and quality so it can be worn with pretty much anything in your wardrobe. The one complaint many customers have is that the arms are too slim. You may need to buy a size or two up if you want to wear a suit or sweater underneath. Just keep fitting in mind before you purchase this one. Another Kenneth Cole peacoat but this one comes with a bib. It’s 52% wool, 44% polyester and 4% other fibers but it is not that heavy. That also means that is is not that warm as far as winter coats go. But it is definitely good enough for everything but the coldest weather. Perhaps perfect for California winters. The reason why it isn’t as warm as the other coats on this list is that it doesn’t hang past the waist for some people and the inner liner stops above the waist. There also isn’t much room in the sleeves for layering. The collar is a bit short in that it may not completely cover the back of one’s head. What it does have going for it is style and quality. It particularly works for those who prefer more form fitting coats as it is a little tight around the arms and shoulders but fits right everywhere else. Just like any suit jacket or coat, there are a few threads sewn in to keep the pocket closed. So if you cut a few of those threads, you will have a functional pocket. 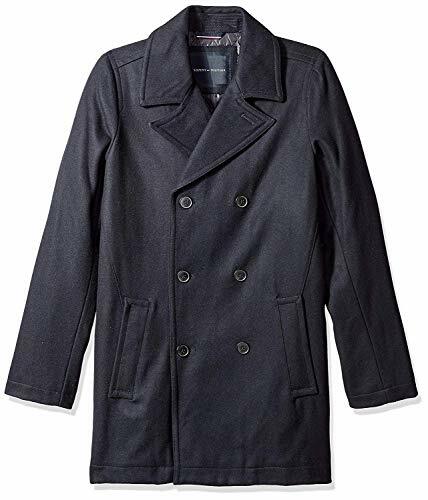 This Nautica Men’s peacoat with a bib is 100% polyester but looks and feels like a wool blend coat. It is great for business casual wear. It is rather warm and does a good job of blocking the wind but could arguably be fitted a tad bit more. The bib adds some extra warmth and dimension to the coat to suit your style. The collar looks nice when put up and offers protection against cold windy days. The arm length is slightly longer than your average coat but it does a good job of protecting your hands against the cold, especially if you wear gloves with it. The pockets are well lined and deep which is important if, like me, you like storing gloves, hats and other accessories in your coat. A peacoat is one of the few coats that provides a classic, tailored and versatile look. It is not too traditional, not overly smart, and not boring. Perhaps grab one of the five peacoats that we’ve recommended in this article to pair with anything from a suit to jeans to a T-shirt. Let us know your favorite style of peacoat and how you dress it up.